Humans thought the wolves died off two centuries ago in this bleak post-apocalyptic wasteland. But some survivors lurk among the humans by mentally cloaking their animal bodies. One white wolf, Kiba, scours the land for the scent of the Lunar Flower that will lead them all to Paradise...but will it lead them to a deadly false legend? 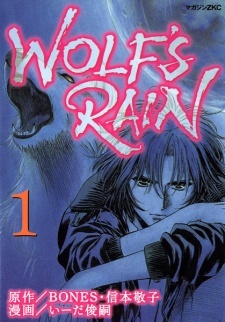 Wolf's Rain was published in English by VIZ Media. I almost cried, and it is a strong story. So, I watched Wolf's Rain before I read it, and honestly, for the first time in like, EVER, I preferred the anime to the manga- the manga is usually easier to follow and it, like a novel, usually has more details than the movie version (or anime version in this case), but here... no. Honestly, I found the anime had a lot more detail and a better ending, not to mention, in the manga I found myself wondering how Hubb and Quent met and how they found Cher, and it was just a little tricky for me to understand. In the anime you see a lot more and I preferred that. Both have a great story, great art, and amazing characters that you HAVE to fall in love with, but honestly, overall, I'd recommend the anime over the manga.